The graphical representations of a grammar are called Syntax or Structural tree. 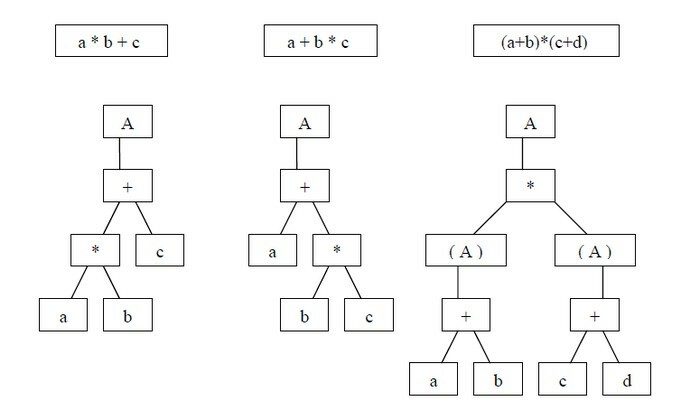 A parse tree is a record of the rules (and tokens) used to match some input text whereas a abstract syntax tree records the structure of the input and is insensitive to the grammar that produced it. There are an infinite number of grammars for any single language and hence every gramar will result in a different tree form because of all the intermediate rules. An abstract syntax tree is a far superior intermediate form precisely because of this insensitivity and because it highlights the structure of the language not the grammar. “static semantic” analyses like checking that all variables are defined. and computing various metrics of a program. Most of these operations will need to treat nodes that represent assignment statements differently from nodes that represent variables or arithmetic expressions. Gamma, Erich; Helm, Richard; Johnson, Ralph; Vlissides, John (1994-10-31). Design Patterns: Elements of Reusable Object-Oriented Software (Kindle Locations 5190-5195). Pearson Education.